As the dam breach flood waters swept down on four year old Bradley Gale Brown, early on Sunday morning June 16, 1963, he had no idea that there was a brand new, but defective dam only 5 miles upstream from his family. This dam had just failed catastrophically, on its first filling, sending 7 million gallons per minute downstream. While his father frantically moved the station wagon full of some of his sleeping family, he could not imagine the magnitude of the flood that was sweeping the adjacent tent full of young boys down the river. Bradley’s older brother survived but had to go to the hospital after the incident while his two friends were uninjured. Bradley was not so fortunate; he became the first and only direct dam failure casualty in Utah history. There have been two other fatalities attributed indirectly to dam failures in Utah. Bradley would now be 54, if he had survived. When the Browns selected the campground on the Duchesne River in the Uinta Mountains 50 miles east of Salt Lake City, they had no concept that they were camping at the headwaters of a tributary to the mighty Colorado River. The Colorado had politically been appropriated among its contiguous states years before the Depression with the Colorado River Compact, and the participating states were finally getting busy taking their fair share of the water. The young family was unaware of the plan, devised years before the Second World War, to divert some of Utah’s share of the Colorado from the river’s natural basin towards the Provo River and Salt Lake City. There was no Economic or Environmental Impact Assessment, no Hazard Assessment or Risk Analysis, and no Standard Operating Procedures or initial filling plan devised for the water project. There was no Emergency Action Plan, Inundation Study or Evacuation Plan prepared in case of an accident at the dam. This was the early 1960's, when John Kennedy was President and the country still enjoyed a post war confidence and prosperity. These were heady times when seemingly infallible scientists and engineers ruled the country, putting a TV in every home, a man in outer space, and a dam on every river. The Little Deer Creek dam was part of the Kamas Water Project, conceived in 1944 and finally approved by the Utah State Water and Power Board in 1958. The dam was planned in conjunction with the Duchesne Tunnel project that piped Colorado River water to the Provo River. Little Deer Creek was a small tributary to the Duchesne River, whose waters could be collected, stored and diverted to flow thru the tunnel after spring runoff, with the construction of a small 75 ft high dam at 9000 feet m.s.l.. The Duchesne Tunnel was already functioning at its design capacity in 1958, diverting as much of the peak snowmelt runoff as it could handle. The Provo River was already showing the effects of adding this additional water and energy to the natural peak spring runoff flows, and the adjacent landowners rightly feared flooding, bank erosion and destabilization of the river. Flows from the adjacent Weber River were also added to the Provo and a protective dike system was constructed to contain the additional flows, further exacerbating the destabilization of the river. 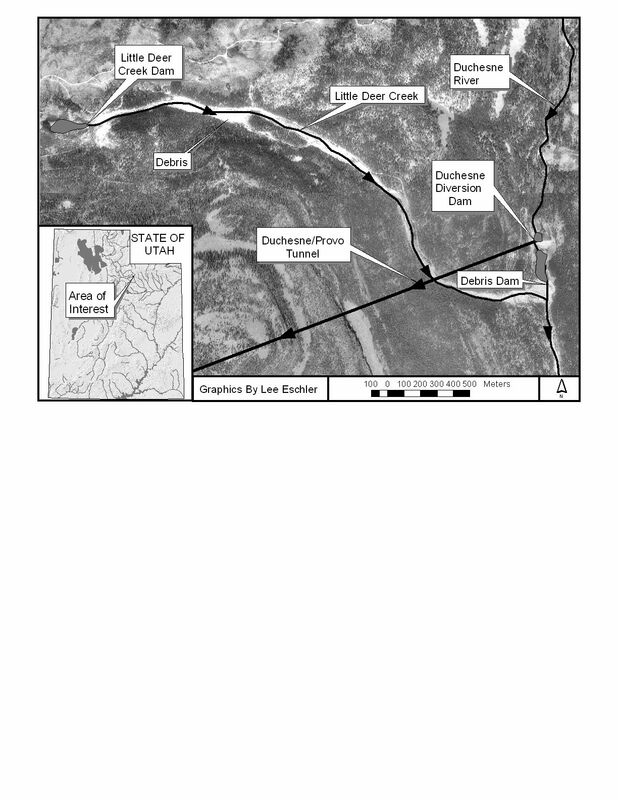 Upstream storage on the Duchesne would allow diversion of snowmelt water during the summer months when flows in both rivers declined substantially. The three pages of the dam’s design drawings were based on only three test pits and three drill holes. The simple homogeneous design included a three-foot deep cutoff, an 18-inch reinforced concrete culvert in a concrete cradle and a spillway over the left abutment. Elvon Bay was the site engineer for the State Water and Power Board and recorded the construction log. The Weyher Construction Company won the bid an began work late, in August of 1961, after finally receiving design approval from the State Engineer Wayne Criddle. Les Staples was the job superintendent for Weyher. The earthwork subcontractor was the Berquist Construction Company represented by John Mills. The autumn of that year was especially inclement and the contractors worked in difficult, wet and cold, early winter conditions. The construction log made many references to the freezing weather, the wet fill, the jointed and fractured condition of the rock on the right abutment, the probability that it could seep and pipe, the inadequate three foot cutoff (bedrock was 17 feet deep) and the lack of structural integrity of the outlet pipe. 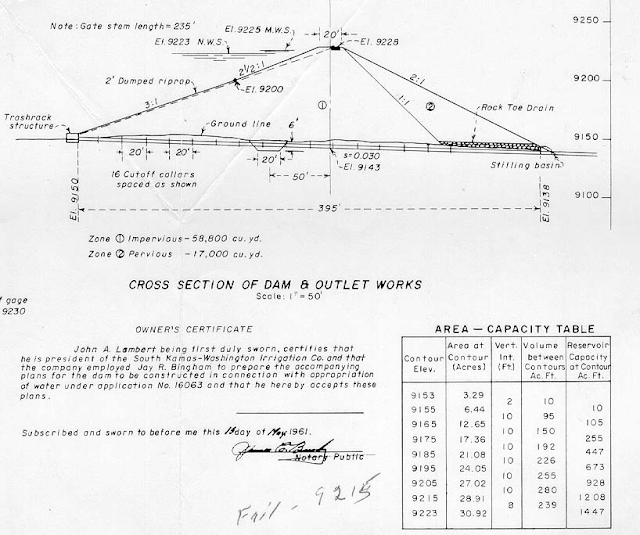 The US Soil Conservation Service, in their review of the dam, made several comments about the design and recommended a drainage system on the seep area on the south (right) abutment. During the first construction season, water was noted flowing from the right abutment downstream of the dam but it was determined that it was “not to be coming from the dam”. This water, however, was noted to be flowing with a muddy color, the color of the fill material of the dam. Instances were noted of the placement of wet sloppy fill during rain and snow events with moisture as high as 16.8%. Instructions were given to leave rocks in the wet fill, not to over compact, to place fill in one-foot layers and compacted to 95% density. This was later reduced to 92% density and 9% moisture, not the design tested optimum of 6%. Work was stopped on October 26, 1961 because of bad weather and wet fill conditions. The outlet gate was not installed and the reservoir did not fill. Heavy snows closed all the roads a few days later with some of the work crews barely getting off the site. In July 1962 work began anew after melt-off and the downstream dam face was described as “spongy” with a small slump formed in wet material, emanating either from a seep or a snowdrift. A serious shear zone was defined, removed and recompacted. Although the dam appeared in “rough” condition the dam builders confidently said they could repair the slump, re-compact, and make the dam structurally safe. A spillway was dug from the natural ground on the left abutment and coated with rough concrete on the right (dam) side of the channel, before it passes the downstream toe of the dam and drops steeply down the slope to the main channel. A large section of the reservoir basin and right abutment were cleared of trees and there was a stream/spring entering the reservoir just upstream of the dam. A diversion was made from lower Little Deer Creek to the entrance of the Duchesne tunnel. The outlet gate was installed and closed. The dam was completed that autumn and cost approximately $100,000 to build. 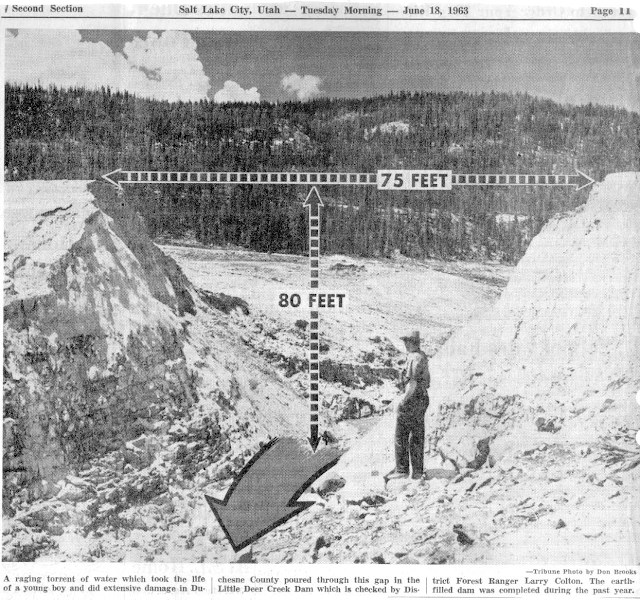 The dam failed during its first filling in the Spring of 1963 with the water at elevation 9215 feet, or 62 feet on the concrete stage gage with 1200 acre feet in the reservoir inundating over 28 acres. The spillway elevation was 9223 feet with the top of the dam at 9228 feet. Breach times are currently estimated at between 1.0 - 1.5 hours with maximum flows between 14000 and 17000 c.f.s.. The final breach was 80 feet deep and 75 feet wide and extended 17 feet below the dam to bedrock. Downstream damage was extensive and is still visible today There was a scouring of the immediate downstream toe area, followed by several acres of deposition above a grade control rock out crop where pieces of the outlet are visible. Below the grade break is another steep, scoured channel that dumps into the much flatter Duchesne River downstream of the diversion dam for the Duchesne Tunnel. There is a huge debris deposit at the confluence that backs up a small lake/wetland area to the base of the diversion dam. After the dam failed the flood waters took five hours to reach the towns of Hanna and Tabiona, 15 miles away, and roughly 12 hours to reach the town of Duchesne, 45 miles away. Ten out of eleven bridge crossings on the Duchesne River were washed away with the flood and there was also minor damage to farms next to the river. It also inundated the small Ashley National Forest campground on the Duchesne river. The bridge repairs were estimated at $190,000, the Browns filed a claim for $31,000, and additional claims totaled $96,000. Today, the remnant of the Little Deer Creek Lake has a small, natural grade control at the outlet and supports a healthy lake, wetland and littoral length. Moose were feeding in the lake as we performed the forensic reconnaissance in August 2002. The clearing originally done for the lake was evidenced only by the age of the younger trees growing below the old high water line. The stream flowing from the right abutment near the outlet intake was flowing 1 c.f.s. and an adjacent spring was flowing 5-10 g.p.m. during the latest visit. . A complete section of the dam embankment, with a vertical face, remains on the right abutment but the left side of the dam has been completely removed. The most striking features of the small piece of the old embankment are the sandy gravel matrix with very little 200 minus, excessive amounts of 3 - 6 inch cobbles and boulders as big as 3-10 feet in diameter. There is a slump on the right side of the remaining crest over the right abutment. The maroon quartzite visible on the right abutment is highly fractured and jointed with intermediate green siltstone layers every 8 -12 inches. The main open joint patterns trend steeply downstream at approximately the slope of the stream and appear to be at a favorable piping orientation. A piece of the old spillway structure remains high and dry on the left abutment, with a “Utah State Engineer” survey monument embedded in the concrete. Seventy-two feet of the storage gage remains on the upstream left abutment and the borrow pit of the right abutment still contains an old culvert and plow blades. The Fuhriman and Rollins Engineering Company prepared a report on the failure in November of 1963. This report cited seepage, thru the unsealed and unfiltered right abutment, as the probable cause of failure. Attorneys working on the case also noted the wet weather, wet fill, insufficient cutoff, large boulders in the fill, insufficient bedrock preparation and a change in the specification from a zoned embankment to a homogeneous embankment. Optimum densities of the embankment soils tested after the failure were 137.8 lbs per cu ft and 6 percent moisture, more dense, dry and closer to optimum than those tested during construction. From the lateness of the dam design submittal and approval that delayed construction until August, to the bad weather encountered during construction, a series of mistakes, oversights and natural conditions contributed to the failure. The design and exploratory testing were marginal, the site preparation was minimal, the construction quality was questionable and the condition of the bedrock was underestimated. The dam was built 17 feet above bedrock with only a 3-foot cutoff and the right abutment was not blanketed, drained or filtered. Large boulders and wet soil further compounded the probability that something catastrophic could happen. Seeps and slumps after the first winter gave clues that something was not right, yet only Band-Aid solutions to these problems were implemented. One mistake is usually not enough to cause a catastrophic failure of a modern earthen dam, given the redundancies of the design as well as the large factor of safety attributed to the materials and dam geometry. Earthen dams are usually very flexible and forgiving, provided that they are built properly out of the correct material and that seepage is properly collected, controlled, filtered and conveyed away from the dam. Most likely it was a combination of several small deficiencies that caused the ultimate failure. Perhaps it was overzealous water resource development, bureaucratic delay, unfortunate weather, inexperienced personnel, budget constraints, unfavorable site conditions, ego, arrogance or our consistent underestimation of the patience, power and persistence of water. The problem with dam breach forensics is that most of the evidence is flushed downstream. Sometimes we don’t know what we don’t know. The remains of Little Deer Creek Dam still stand as a monument to the delicate humanity of Bradley Gale Brown, to the humility of the men who built it, and as a warning to future generations to respect the strength and complexity of nature. Hopefully we learn from our mistakes, ideally before we repeat them.